As head of the state, the President of India is the focal point of all state ceremonies and there are three mansions — Rashtrapati Bhavan at New Delhi, Rashtrapati Nilayam near Secunderabad and The Retreat at Mashobra, near Shimla — designated as his official residences. Of these, the most magnificent building is that of Rashtrapati Bhavan in New Delhi, known in pre-Independence days as the Vice-Regal Palace. It is one of the most beautiful and extensive edifices of the world. In 1911 the initial estimate of the construction cost was Rs 13 million, including all the furnishings. But the 1914-18 war inflated the cost to Rs 17 million. According to one architect, today’s cost would be at least 500 times more in view of the decline of the purchasing power of the rupee. The palace, covering nearly five acres, is 200 yards long, 180 yards wide and has a beautiful garden of 28 acres. It has 340 rooms, 74 lobbies and galleries, one and a half miles of corridors, 18 staircases and 37 fountains. It is constructed out of Indian material, the only foreign material imported being the Italian marble for the durbar hall used for official ceremonies. Five hundred workmen laboured for two years to copy famous Persian carpets to furnish the floors of the palace. Today this mansion also houses a museum, displaying the various costly presents given to the Indian Presidents in the past five decades and other historic treasures of the Vice-Regal days. The state halls of the palace consist of the durbar hall, the dining hall and the drawing room. To quote one architect: "The grandest room in the whole mansion is the durbar hall, and its impact on the visitor is immediate, overwhelming and utterly silencing." In the 1980s the maintenance cost of the Rashtrapati Bhavan was estimated to be about Rs 2 crore annually. But in 2007, it is estimated to be at more than Rs 100 crore per year! 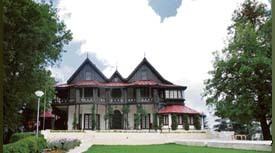 The smallest of the official residences of the President is The Retreat at Mashobra, seven miles from Shimla. Till 1962 a huge palace, the summer residence of the British Viceroys (known after 1947 as Rashtrapati Niwas), housed the presidential establishment. But in 1962, as an economy measure, this mansion was handed over to the Government of India by the then President, Dr S. Radhakrishnan, for an academic institute. Instead, The Retreat was officially assigned to be the presidential mansion. The Retreat, a 16-room edifice, surrounded by a 300-acre forest, was built in the 1840s and is situated amongst the picturesque scenery at an elevation of 7000 feet. The President occupies it only for two weeks in a year during summer and as such it is mostly used by the Government of India to house foreign VIPs visiting Shimla. Even now the property belongs to the former Raja of Koti, and is given to the Government of India on a permanent lease. After India’s Independence, Pandit Nehru, Indira Gandhi and Rajiv Gandhi had very often used its scenic location to recuperate from political problems. 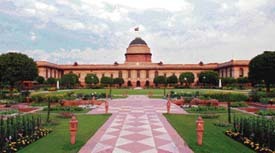 The "newest’ of the official residences of the Indian President, Rashtrapati Nilayam at Secunderabad, came into being as a result of India’s Independence. In the first decade of freedom, the separatist tendencies evinced by some political organisations in South India caused concern to the founding fathers of the young republic. Among the various slogans of the separatists, one was that the President of the Indian Republic had all his official residences in north India. As such in 1955, the then President, Dr Rajendra Prasad, decided that there must be an official residence in South India, so that during his visits to the South, the local populace doesn’t feel that he comes as a "guest" to the various Raj Bhavans. Since the President was likely to spend only six to eight weeks every year in South India, a small edifice was to be chosen, so that the annual upkeep could be kept at the minimum. The mansion chosen by President Rajendra Prasad in 1956 had been originally built by the British in 1870 as the summer resort for the British Resident to Hyderabad state, who found the town cooler than the nearby cantonment of Secunderabad. This building with the total land area of 101 acres, is a single-storeyd edifice, with a dining hall, durbar hall, morning room and other ceremonial halls. There are 16 rooms for the President and his staff. There is also a visitors’ annexe which can accommodate more than 150 people.